Both images that make up New Work #185 were taken from approximately the same position in space outside of Earth’s orbit. 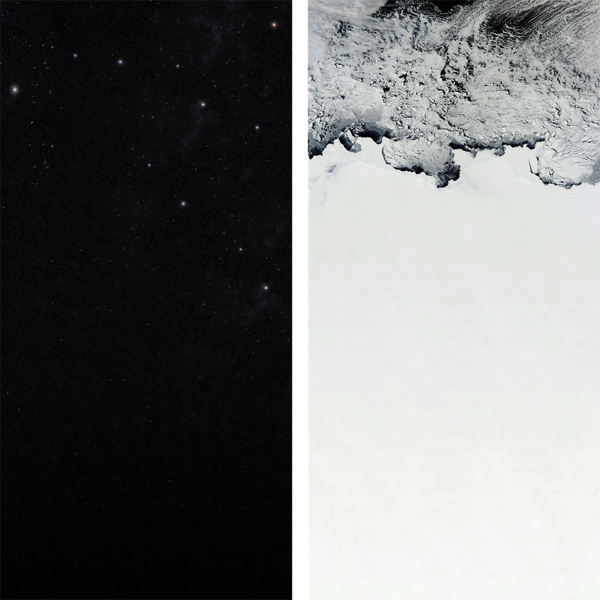 Sourced from the Internet, the image on the left pictures deep space beyond our planet, while the image on the right directs our gaze inwards, to a polar ice cap of Antartica. The push/pull of outward and inward reflection is echoed in the surface treatment of the two pieces, with the high gloss of the black surface contrasting the ultra-matte finish of the white photograph.